. : Farm Forest Line - Site preparation for tree establishment :.  providing shelter from the elements. The technique(s) chosen will largely depend on the factors currently limiting site quality, costs involved, availability of appropriate equipment and anticipated impact(s). The impact of site modification on growth can be dramatic where treatments are able to address the factors most limiting to growth. Two examples that clearly demonstrate this are the effect of controlling weed competition in young plantations and the effect of deep ripping on soils with pronounced shallow hardpans. However, as forests develop the factors that limit growth will change. 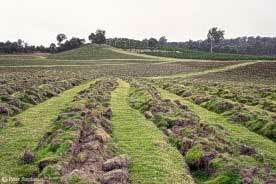 Intensive site preparation and fertiliser use to promote early growth might not provide any long-term advantage. These strategies might only mean the plantation reaches the growth limits set by other resources more quickly. Farmers must have a clear purpose in mind when they modify a potential farm forest site. In many cases farmers might not be able to justify the financial costs of intensive site preparation, and its effect on other valuesfor example, the risk of erosion or leaching of nutrients and chemicals. Farmers might also be able to save a lot of money by using their own equipment or methods to achieve a similar outcome. Identifying resource and environmental limitations is the key to determining the most appropriate establishment method. Resource limitations include time, cash and equipment. Environmental limitations include drought, vermin, waterlogging, hardpans, rocks and weeds.